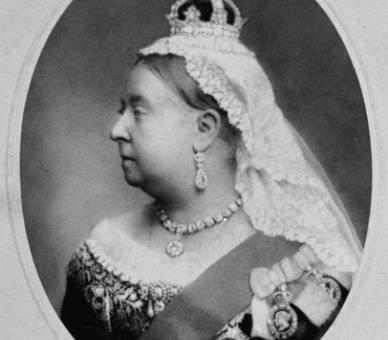 Our collection begins in the year 1900, with the arrival of Queen Victoria. The actress Maud Gonne, who lived on this square in that year, was bitterly opposed to the visit. She called Victoria the ‘Famine Queen’ and the head of an empire who left the English working class with ‘no blood in their veins, no strength in their arms.’ When it was announced that Victoria was hosting a children’s party in Phoenix Park, Maud Gonne set up a rival event for 30,000 Dublin kids: the Patriotic Children’s Treat. 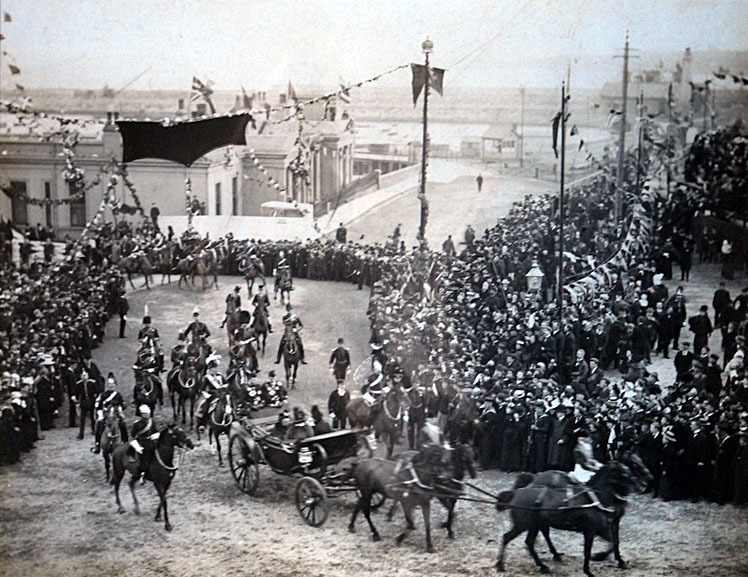 This picture shows the arrival of Victoria in what was then called Kingstown, now known as Dun Laoghaire. You can see Dun Laoghaire pier in the background, the aging Queen herself, and her loyal subjects lining the streets. In the Freeman’s Journal the following day we learn that a mock castle was erected in the Queen’s honour at Leeson Street Bridge, just so the Queen could have the experience of going through her castle gates to her city. This led to one of the most celebrated typographical errors of all time, when the paper is said to have reported that there was much delight when the Queen’s party pissed over the bridge. 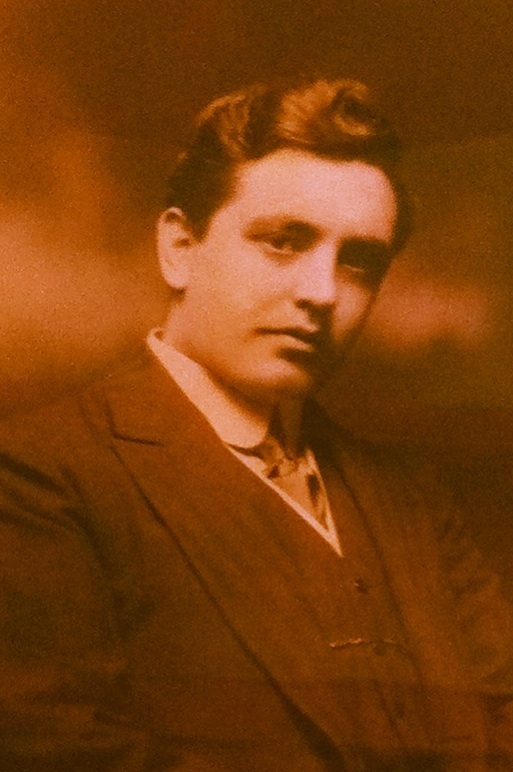 This is a signed photo of the great tenor Count John McCormack, who could sing 64 notes on a single breath (in Mozart’s Don Giovanni). 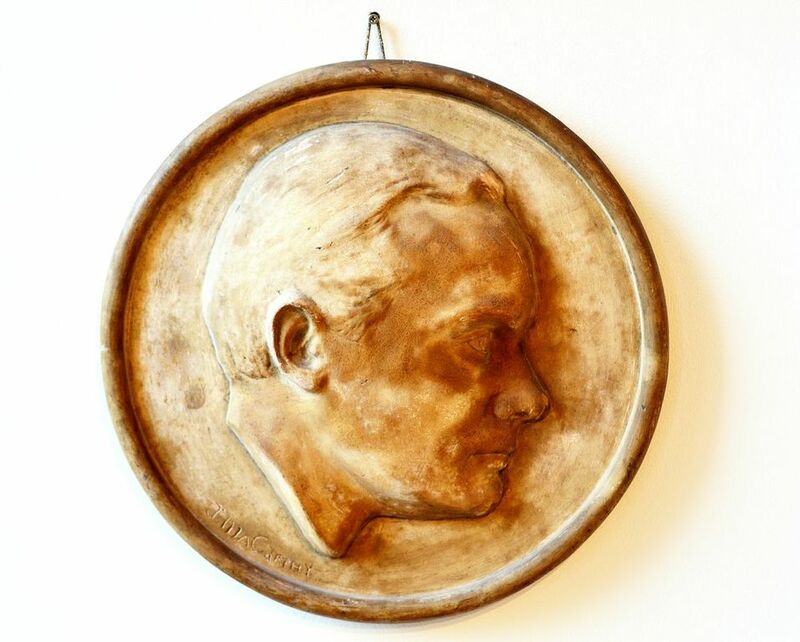 In 1904 McCormack gave James Joyce singing lessons before Joyce entered the Feis Ceoil tenor competition, winning a very respectable bronze medal. That same year Joyce met Nora Barnacle on June 16, the date on which Ulysses is set. Today we know that date as Bloomsday. 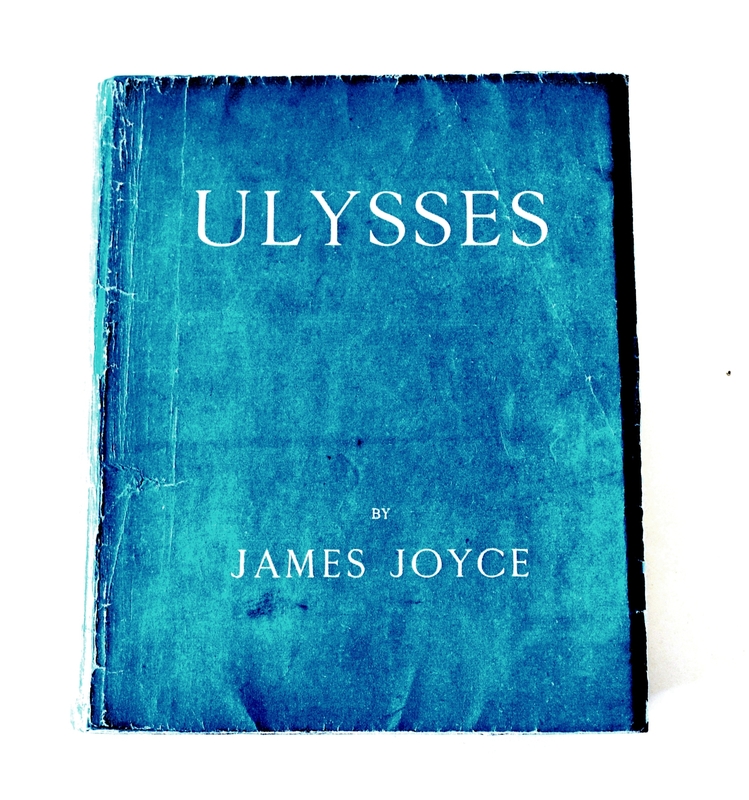 This is the first English edition of Joyce’s masterpiece. 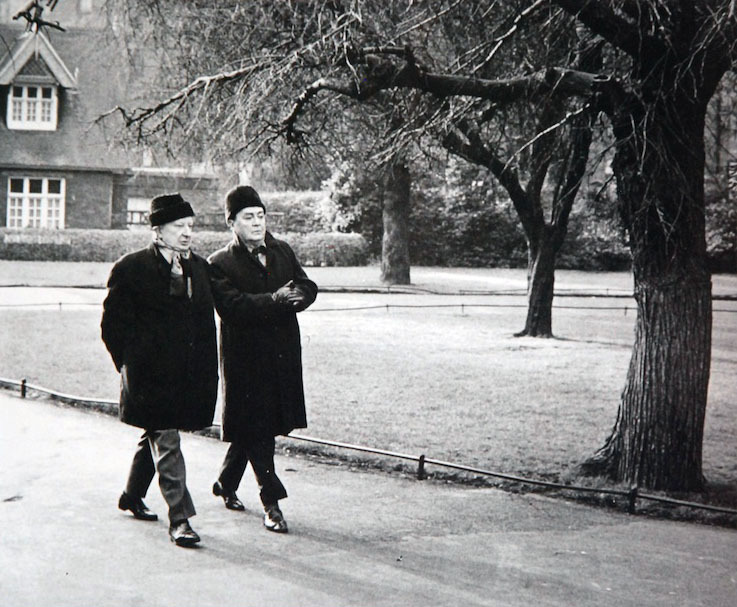 Most Dubliners will admit, after a few drinks, that they have read the first page of Ulysses. In their honour we’ve decided to leave our copy open on the last page, so our visitors can at least say they’ve finished reading Ulysses. A hundred years ago Dublin was smaller than Belfast. Many people were poorly-housed, poorly paid or chronically unemployed, and the city had the highest infant mortality rate in Europe. 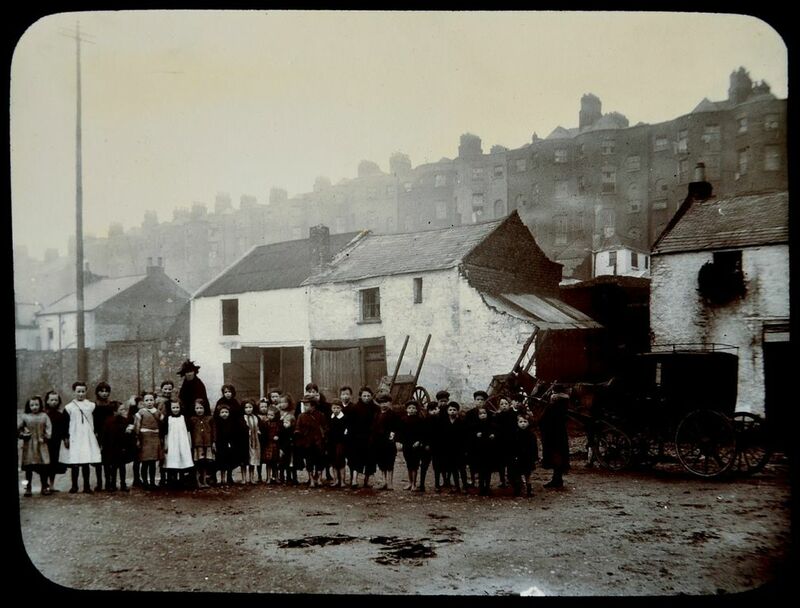 The story of tenement life is depicted in this photograph from the Darkest Dublin Collection. It was taken on what was once the grandest road in Dublin: Henrietta Street. In the census of 1911, we learn that in the 15 houses on Henrietta Street, there were 835 people. In one house alone there were over a hundred inhabitants. 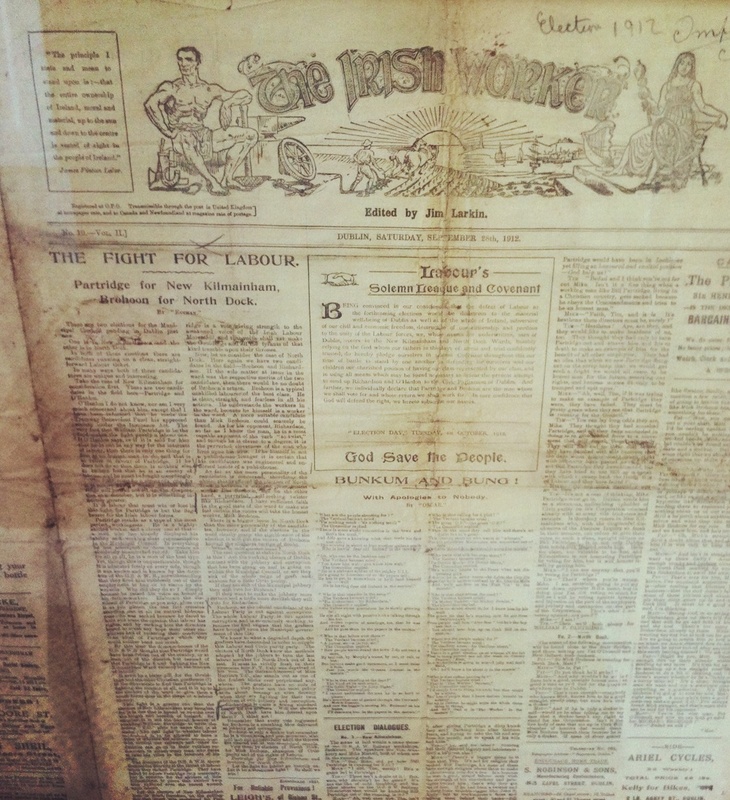 In June 1911, James Larkin, the Irish trade union leader and socialist activist, established a newspaper – The Irish Worker and People’s Advocate, as a pro-labour alternative to the capitalist-owned press. 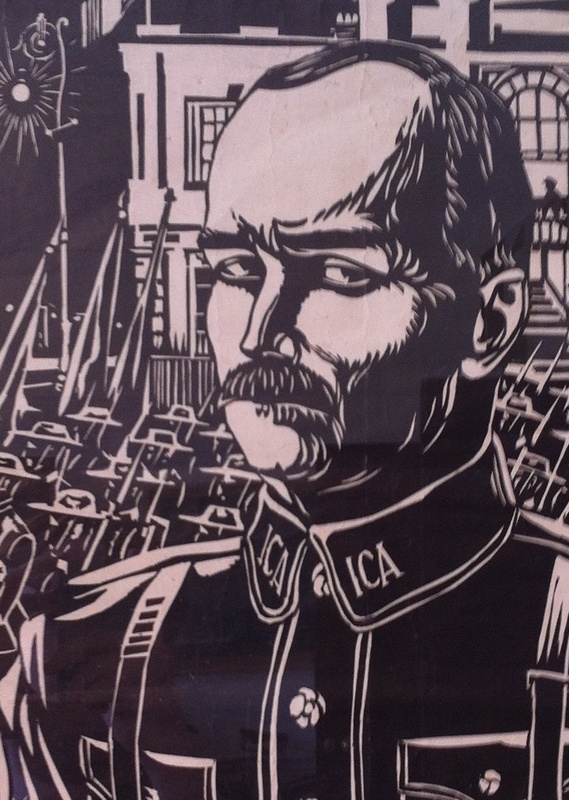 On Bloody Sunday, August 31st 1913, the Dublin Metropolitan Police brutally charged a workers’ rally led by Larkin and by James Connolly in O’Connell Street. By the end of September that year, 25,000 men were off work, just in time for winter. The strikers were supported for a time, but the Lockout ended in defeat, and some people say the Left in Ireland has never quite recovered. 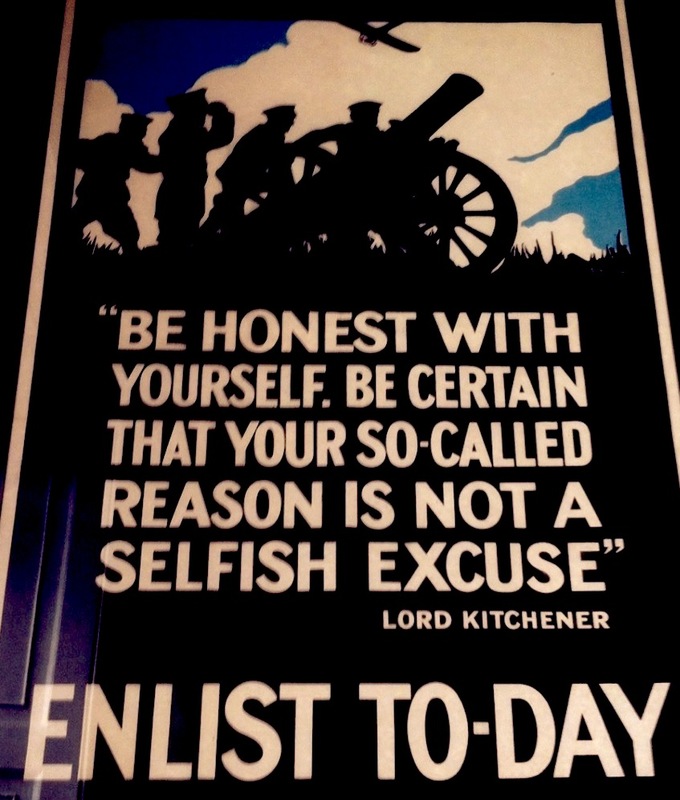 When the First World War broke out, John Redmond urged his supporters to sign up for the British Army – and many listened, if not to Redmond, then to Lord Kitchener, who was born in Kerry. Over 200,000 Irishmen joined up. 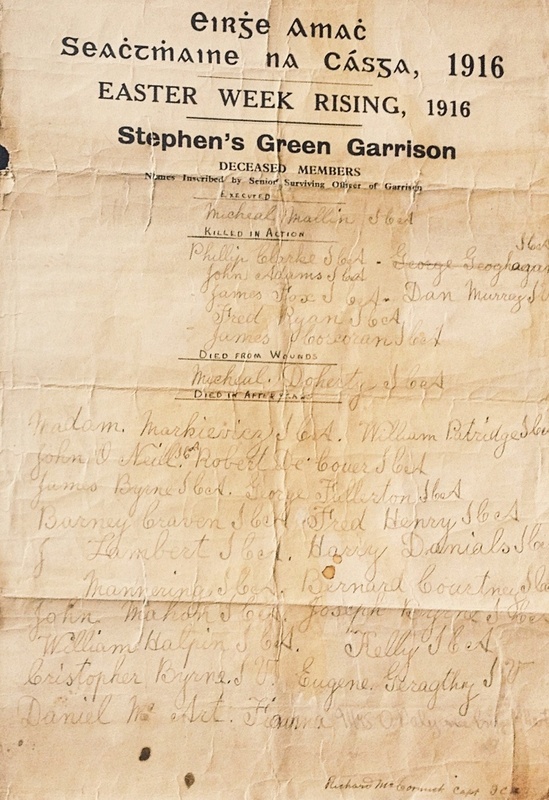 The Heuston family, who lived in the house which now houses the Little Museum of Dublin, had twin sons who fought in World War 1. One of them was among the 30,000 Irishmen who was killed in the war. St Stephen’s Green was the scene of fierce fighting during the Rising. The garrison led by Michael Mallin and Countess Markiewicz was stationed just across the road from the museum, making the rebels easy targets for the British army. 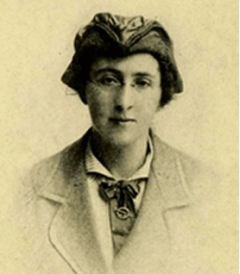 Countess Markiewicz later became the first woman elected to the House of Commons. 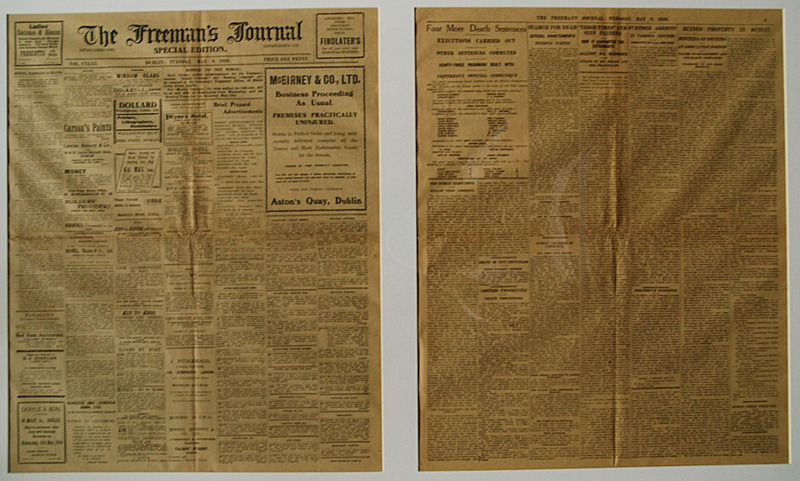 The execution of Michael Mallin is recorded in this edition of the Freeman’s Journal from May 9, 1916. Public opinion shifted dramatically after the execution of the leaders. A schoolteacher from Glasgow called Margaret Skinnider cycled to Dublin for the Easter holidays that year. Miss Skinnider decided to join the Rising on the spot because the leaders promised equal status for women. After being shot across the road from this building, she was captured by British troops, imprisoned and sentenced to death. But she went on hunger strike, survived and later wrote a book called Doing My Bit For Ireland. 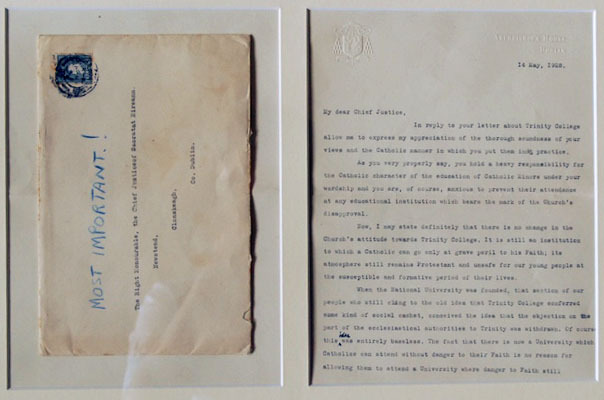 In October 1921 Eamon de Valera signed this decree, sending Arthur Griffith and Michael Collins to London to negotiate the Anglo-Irish Treaty that secured independence for Ireland. This is the most important historical artifact in this museum. 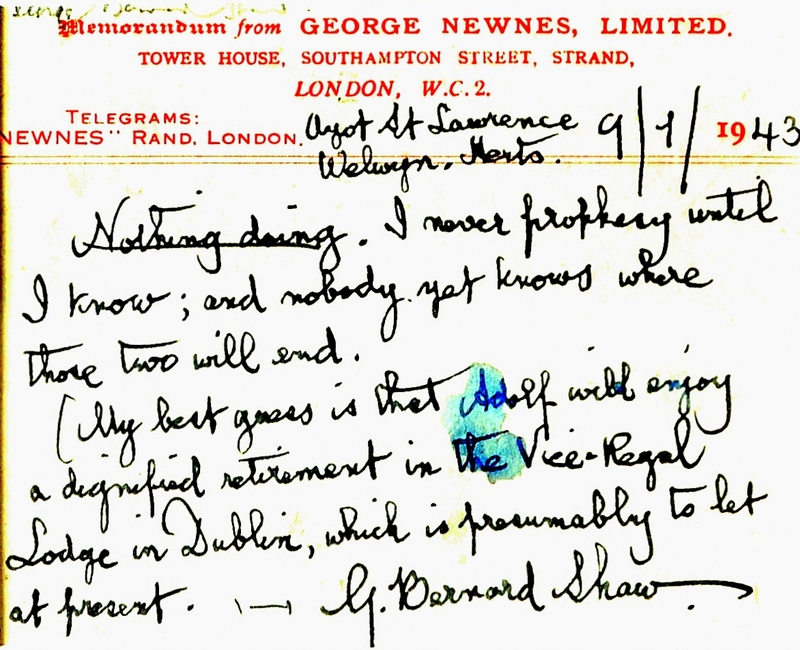 The appointment was signed by de Valera in Irish, and translated on the left. 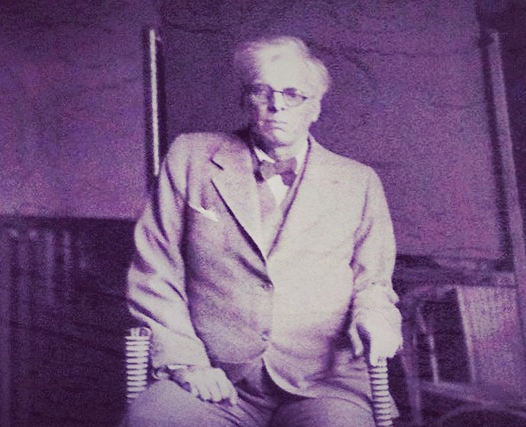 Lloyd George famously said that negotiating with De Valera was like trying to pick up mercury with a fork. When you read the instructions you will see why! When Michael Collins signed that treaty to secure independence for Ireland, he admitted, “I have signed my own death warrant”. 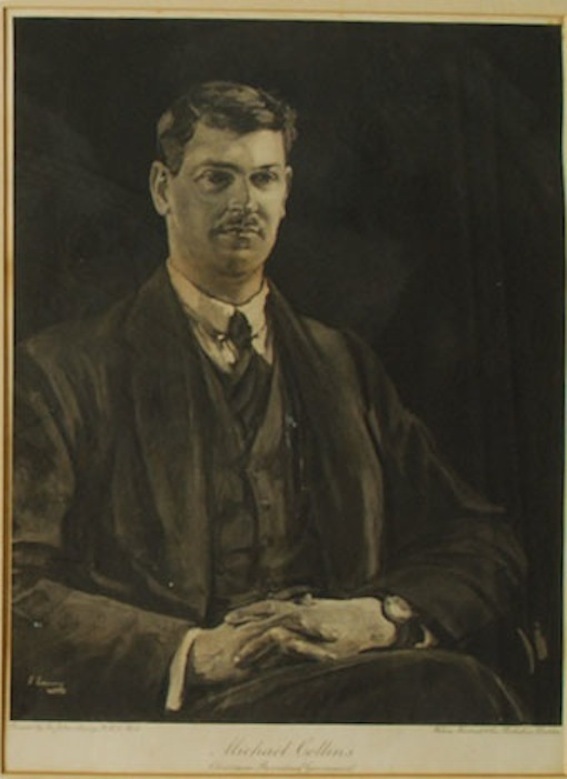 Just eight months later Arthur Griffith died of heart failure, and Michael Collins was assassinated near Béal na mBláth at the start of a short, bloody civil war. So the new state limped into independence. If they don’t go to Trinity College. After taking power in 1932, Eamon de Valera hosted the Eucharistic Congress, with a million people at a mass in Phoenix Park. 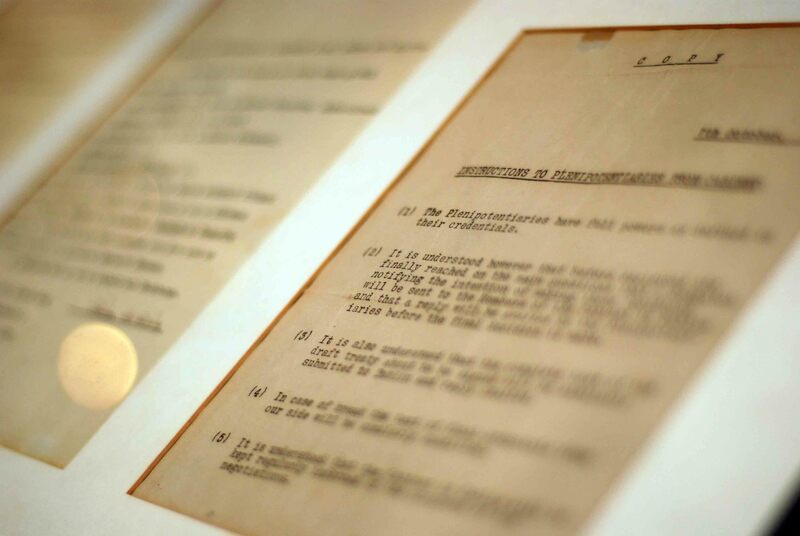 Later De Valera decided to keep us out of the Second World War, or the “Emergency”, as it was known here. 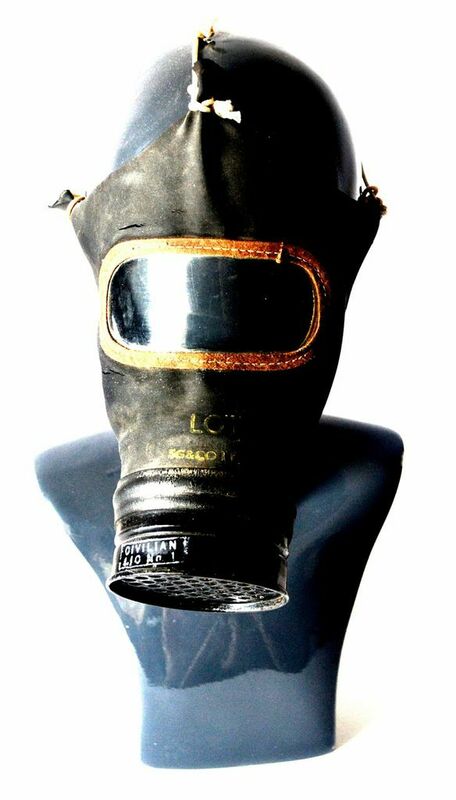 However, rationing was introduced and gas-masks like this were given out just in case. In 1941, 28 people were killed in the North Strand bombings. The 1950s brought more unemployment, huge emigration and occasional light relief. 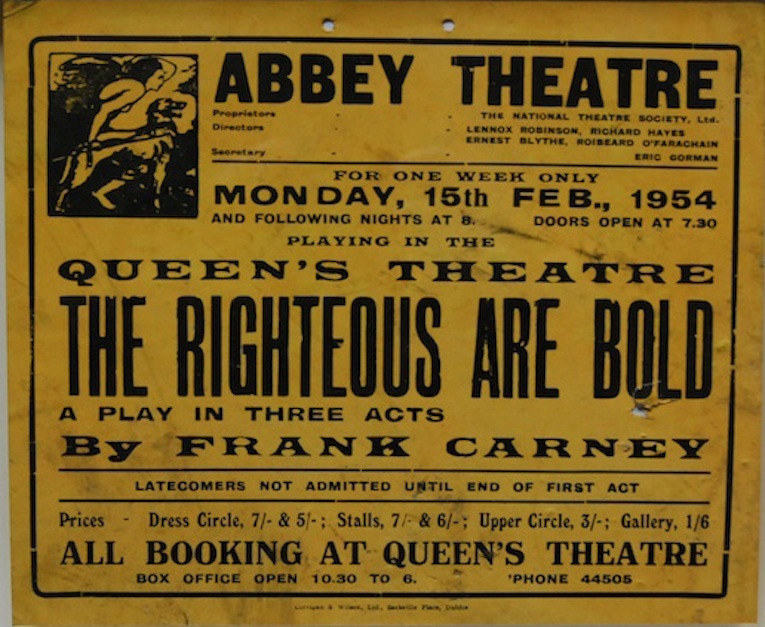 This poster advertises the longest running play in the history of the Abbey Theatre, The Righteous Are Bold. It wasn’t much of a play, but it was hugely popular, because it was the first time a live exorcism featured on an Irish stage. 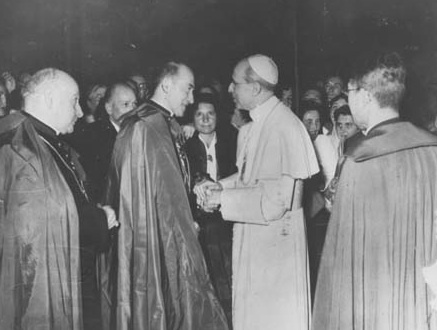 This caused a sensation in Catholic Ireland. 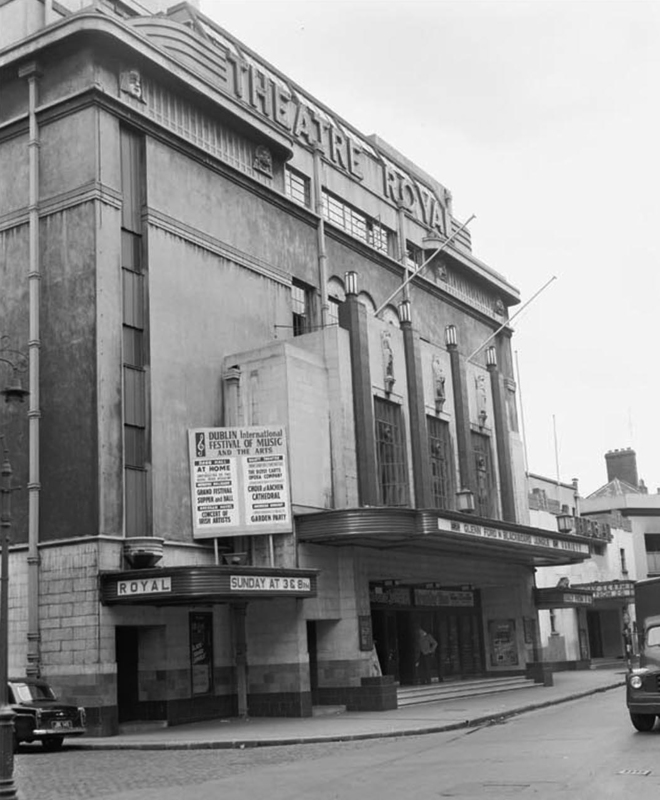 The Theatre Royal was a much-loved Dublin institution. With 3,850 seats it was the single largest auditorium in these islands. Cine-variety got you a show and a movie on one ticket. There was a Compton organ that came up out of the ground. Jimmy Campbell was the conductor. Tommy Dando and the Royalettes were a regular item; Alice del Garno and Babs de Monte; Bob Geldof’s mother worked as a cashier. Judy Garland played the Theatre Royal, wowing punters who couldn’t get tickets by singing from her dressing room window. And Danny Kaye was fondly remembered for many years by the taxi drivers of Dublin. He sang so many encores that everyone missed the last bus home. 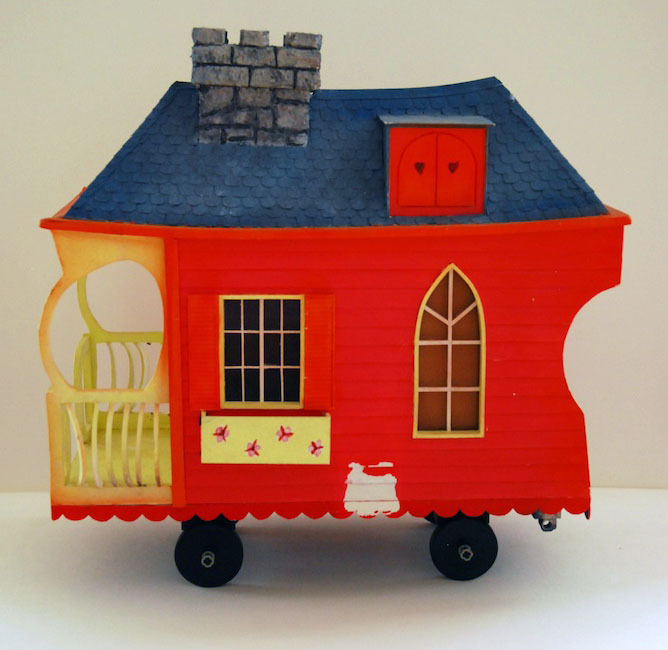 This is the original model from the flying scenes in Wanderly Wagon, the popular children’s television programme. Neil Jordan once directed an episode of Wanderly Wagon (he later made the Michael Collins movie). In the 1960s the Financial Times noted, “the only reason Dublin remained for so long the beautiful eighteenth-century city the English built is that the Irish were too poor to pull it down. Unfortunately, that is no longer the case.” Fitzwilliam Street was once the longest uninterrupted stretch of Georgian housing in the world. 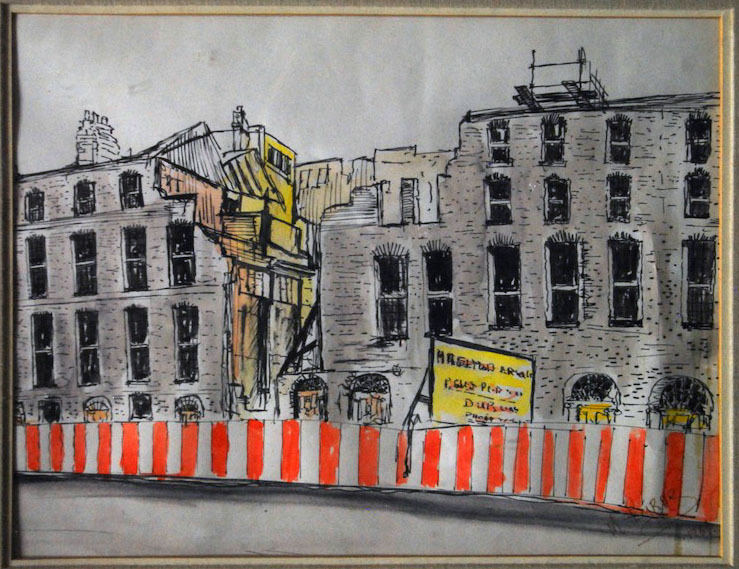 This painting shows old houses on the street after they were torn down to make way for the ESB headquarters. This is the lectern that President John F Kennedy used to address our parliament in June 1963. As you can see, a plaque commemorates the fact and here is a photograph of Kennedy delivering that famous speech, in which he quotes James Joyce’s description of the Atlantic as a “bowl of bitter tears”. 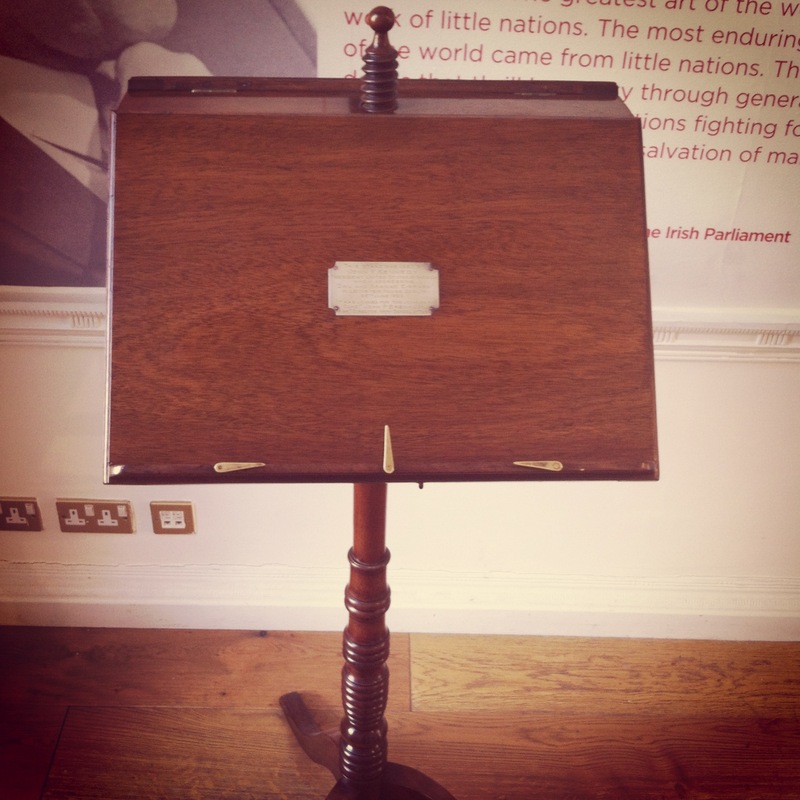 The so-called lectern was in fact a music stand, as speakers in the Irish Dáil and Seanad speak from where they are sitting, rather than from a lectern. On the day before Kennedy’s arrival someone in the government made a frantic phone call to the head of the army band, Captain John Brennock. He kindly lent them his personal antique music stand for the occasion. Rather poignantly, by the time our government got around to returning the stand, President Kennedy was dead. And so we return to St Stephen’s Green. 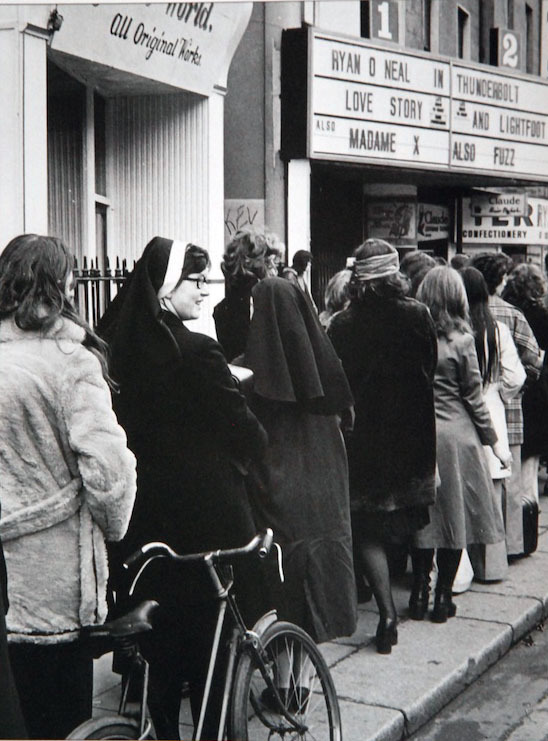 Bill Doyle’s photo captures a nun queuing up outside the Green Cinema, which was here on this square until 1987. The movie she’s queuing up to see is called Love Story. Also pictured in the Green are Micheál Mac Liammóir and Hilton Edwards, titans of Irish theatre and the only gays in the village for about forty years! Liberal Ireland would find its voice eventually. 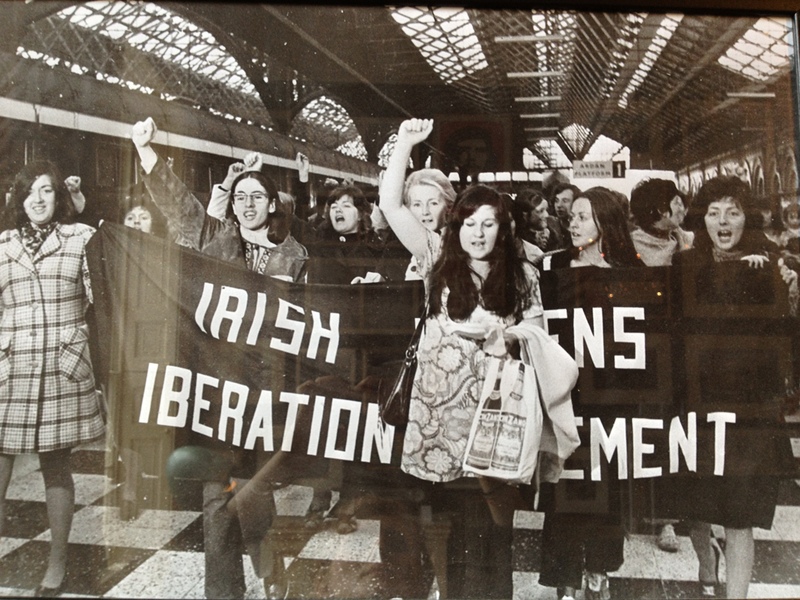 In 1971 the Women’s Liberation Movement went on a mission to Belfast to buy contraceptives. Here we see them arriving back with condoms and spermicidal jelly. If this story has a hero, it’s the people of Dublin. When the IRA bombed Enniskillen in 1987, tens of thousands of Dubliners descended on the Mansion House to sign the Book of Condolences. 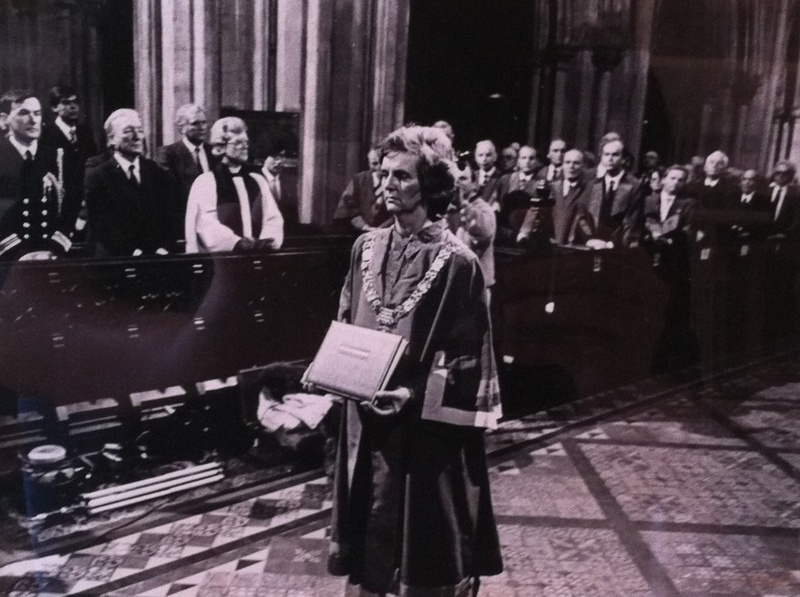 The Lord Mayor Carmencita Hederman remembers having to run back down to Eason’s every hour to buy new books because so many people turned up. That’s the kind of spirit this collection was created to record. 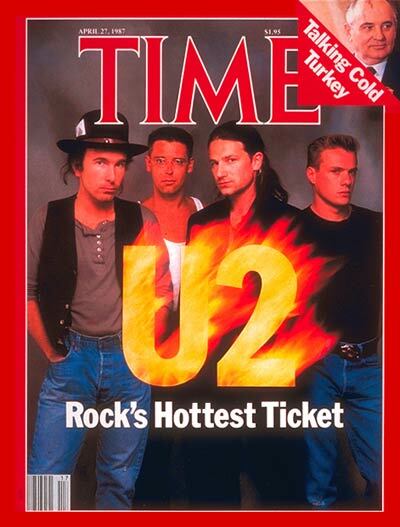 By 1987 U2 were on the cover of Time magazine. The band’s success was an inspiration, but also a challenge, to an entire generation of Dubliners. At one stage it was impossible to enter a nightclub in London, New York or Paris without meeting someone who wanted to murder Bono. Even one of his best friends made a movie called Killing Bono. 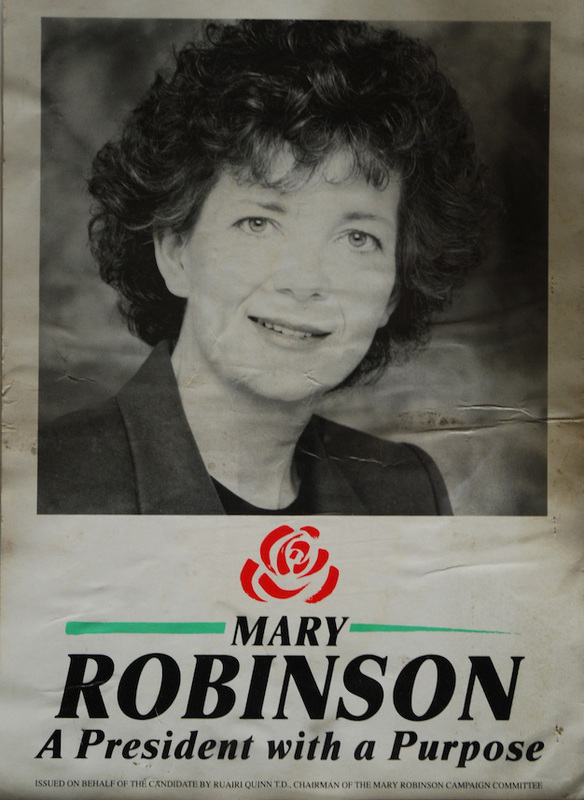 Throughout the 1970s and the 1980s Senator Mary Robinson was a beacon for liberal values. Her election as President in 1990 is remembered with this election poster and with a T-shirt. A seminal moment in the history of the Republic, it cleared the way for other campaigners like Mary McAleese and our current president, Michael D. Higgins, a poet as well as a politician. To finish up, something from the Celtic Tiger era. 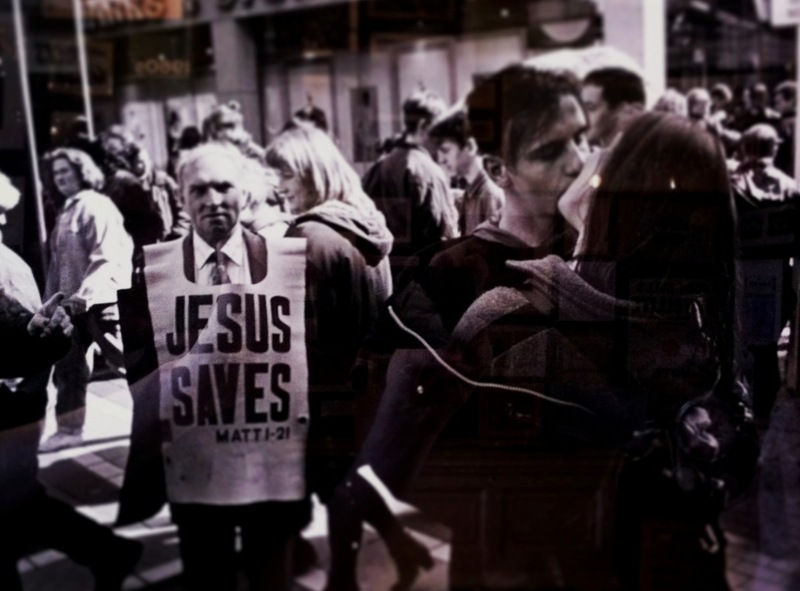 This photograph, ‘The Kiss, Grafton Street’ by Sarah Cully, seems to capture in one image the extraordinary transformation that Ireland undergoes in the 1990s. Note the conservative forces of old Ireland; the rather more liberal forces of the new Ireland; and the neo-colonialism of Marks and Spencer. Then look at the expression on the older man’s face: is it contempt or envy? 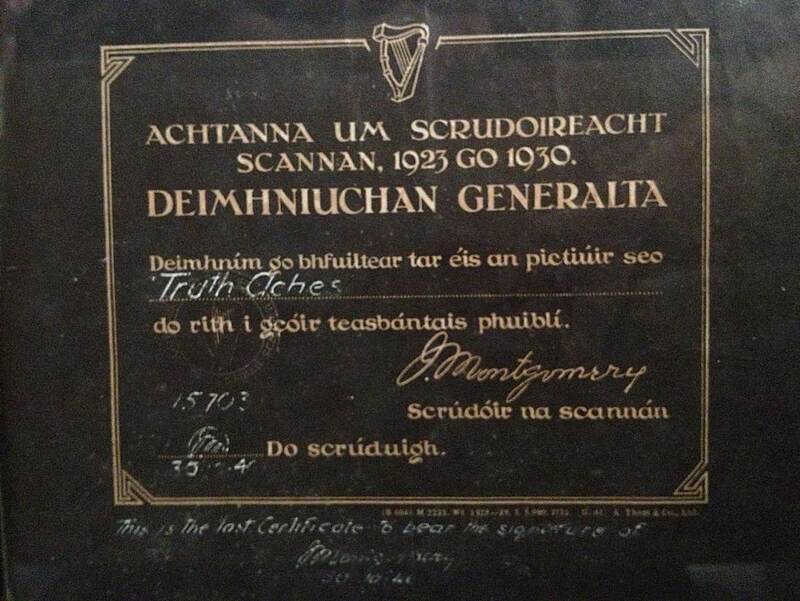 Everything in this museum has been donated by the people of Dublin. We are very grateful to them for supporting our work. If you want to help us grow, please spread the word on TripAdvisor or make a small donation. Dublin is far from perfect; but there is an appetite for change at the moment, and this museum is part of that movement. We don’t pretend that a knowledge of history will make us avoid the same mistakes, but we do feel strongly that Dublin’s best days are both long gone and just around the corner.